Is a new full-frame announcement imminent? Is a new Nikon D600 on the way, to sit alongside the D800? A new set of leaked images of an "entry-level" full frame camera has been leaked online, suggesting an imminent announcement date. 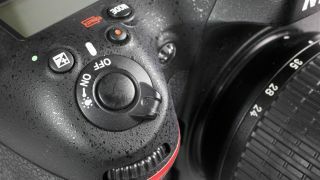 The images appear to show the camera is smaller than the D800, revealed back in February, and is thought by many to be the company's first "affordable" offering in the full-frame arena. Several specs have already leaked regarding the camera, which is thought to have a 24 million pixel sensor - just like the recent D3200 entry-level camera. Other rumoured specs include full HD video recording in a variety of frame rates, a 3.2 inch LCD screen, a weather sealed body and 39 autofocus points with 9 cross types. It was initially suggested that the camera would be fitted with a GPS module to allow for geotagging, but that rumour has, for now at least, been quashed. 2012 is shaping up to be a huge year for Nikon, which has already refreshed the very top of its range in the shape of the Nikon D4 and Nikon D800 and its entry level offering with the D3200 this year. Rumours have continued to persist that Nikon will announce two new cameras to replace the D300S, a DX format (APS-C) camera which is now almost three years old. Since the D600 is rumoured to have a full-frame sensor, it is thought that a D400 featuring a crop sensor will also be introduced. Whether new cameras will be unveiled in the summer, or at the upcoming Photokina photography trade show taking place in September remains to be seen, so keep following for more updates as they happen.